Whether you’re taking a year out after finishing school, having a break to recover from University life before settling down into the real world or taking a career break to re-discover yourself, Eurolines has the network, flexibility and most importantly the low fares to get you where you want to go. Eurolines is the low cost last minute alternative from National Express to over 500 destinations in Europe and Ireland. Eurolines offer daily departures to key destinations including Paris, Amsterdam, Brussels, Frankfurt, Dublin and Belfast, with frequent services throughout the rest of Europe from Tralee on the west coast of Ireland to St Petersburg in Russia. Unlike some low cost airlines, Eurolines offer customers low fares every day, and you don’t have to book months in advance to get them. Our cheapest Euro-Apex fares are available when booking just seven days in advance and are valid on all seats where the fare applies. Standard fares are available within seven days of travel and offer highly competitive last minute deals. As an example, Euro Apex fares from London to Paris or Amsterdam start from £37 return, with standard fares starting from just £46 return. All Eurolines services drop you in the city centre, so you don’t have to worry about the hassle of finding your way from the airport to your hotel and saving you even more money. What’s more, all coaches have reclining seats, air conditioning, on-board washroom facilities and picture windows, which allow you to appreciate the scenery that you pass on your journey. If you’re looking for something a bit different, Eurolines offers the freedom of Europe with the Eurolines Pass. Allowing unlimited travel around the continent for up to 15, 30 or 60 days, it offers total flexibility with the choice of planning your route in advance or booking as you travel - all for one excellent value price. Starting from just £99, the Pass is the most affordable way of taking in some of the most exciting sights and cities Europe has to offer. Go anywhere. Stop anywhere. With Inter-Rail you have the freedom of Europe’s entire network, allowing you to go as you please in 28 countries. From the Northern Lights of Sweden to the Kasbahs of Morocco, you call all the stops. Avoid airport hassles, ticket queues and traffic jams, Inter-Rail takes you from city centre to city centre, giving you more time to make the most of your visit. The flexibility of Inter- Rail means you can travel when and where you want. Nothing beats the European train network for range and frequency. And for a small supplement, you can take state-of-the-art high speed trains such as TGV, Thalys, and Artesia across the Continent. Overnight trains are also available on most major routes, which saves on accommodation costs and means that you can go to sleep in one country and wake up in another! Supplements apply so do enquire at the time of booking. Most major stations such as Paris, Brussels, Amsterdam and Rome have facilities including left luggage and washing amenities. Inter-Rail passes are available for both under and over 26s who want the freedom to experience Europe at their own pace. There’s the 22 day pass which allows you to travel across one zone of your choice giving you the chance to explore a particular region of Europe and the one month pass for travel across more than one zone with unlimited travel to as many as 28 countries in Europe, Scandinavia and North Africa. Inter-Rail have also introduced a new pass for those shorter trips - the 12 day pass - which allows you to nip over to Europe and discover up to three countries. Due to the nature of Inter-Rail, availability problems are rare, which means prices do not fluctuate through the year. Whether you book two months or two weeks in advance, we guarantee you the same great prices all year long. Europe's transport infrastructure is excellent and many smaller towns are well connected. Trying to decipher the different travel modes and companies however can be difficult in foreign countries. 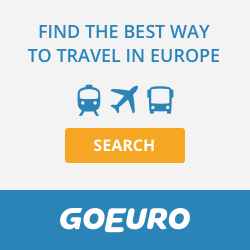 But travel platform GoEuro.com allows you to search for train, bus and air options on one page. Making it an efficient method of researching different modes of transport options whilst in Europe.